1 can drained garbanzo beans. Caramelize onions and wilt spinach with olive oil and seasonings. Pulse sausage, olives, garbanzo beans, and sauce in food processor until well combined. 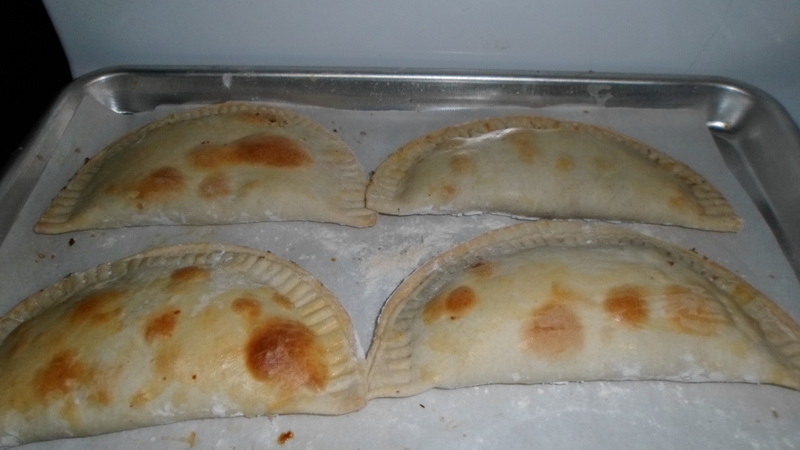 Blend with cooked onions and spinach and place on defrosted empanada dough. Seal with water, press edge with fork and place on baking sheet sprayed with coconut oil. Brush with beaten egg and bake at 375F for 20 minutes or until golden. I intended to use Greek dressing, but had none, so I substituted the tomato sauce. Yummy. Combine flour, salt, and curry powder in work bowl of food processor, pulse to combine. Add the butter or shortening and process until the mixture looks like fine crumbs. In a bowl combine water, vinegar, and egg yolks. Add wet mixture to work bowl and pulse until a ball forms. 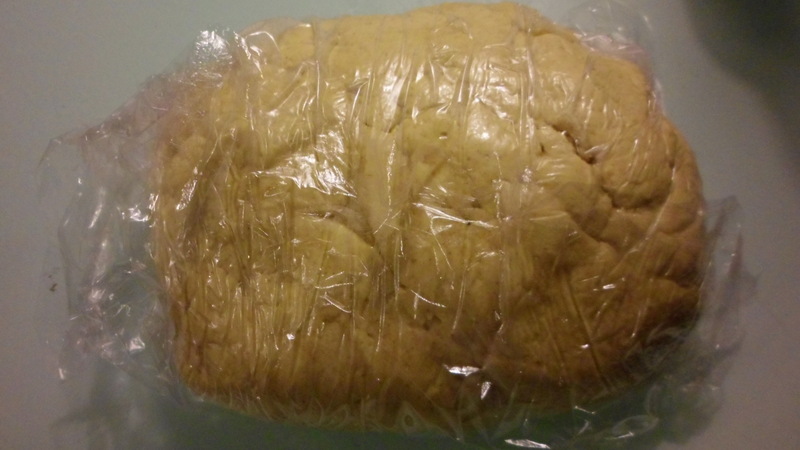 Cover dough in plastic wrap and let rest in refrigerator for 1/2 hour. Heat oil in saucepan over medium heat, add onions, thyme, and hot sauce. 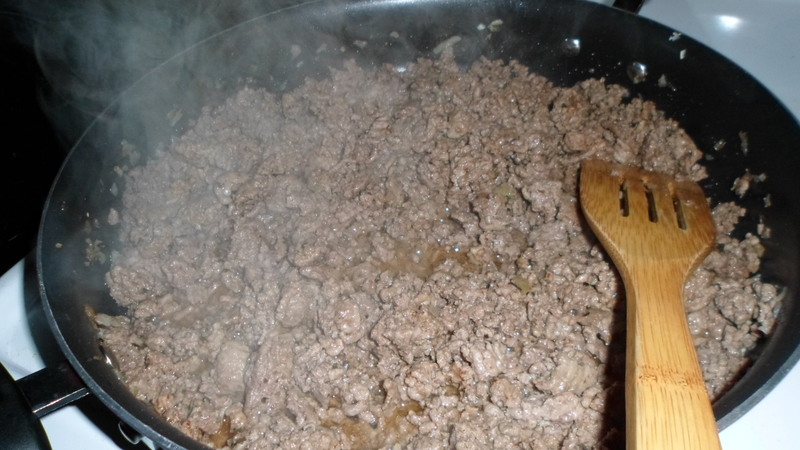 When onion begins to soften, add ground beef, salt, and simmer over low heat for 20 minutes. Add bread crumbs and salt and pepper, allow to cool. Taste to see if more hot sauce or salt and pepper is needed. 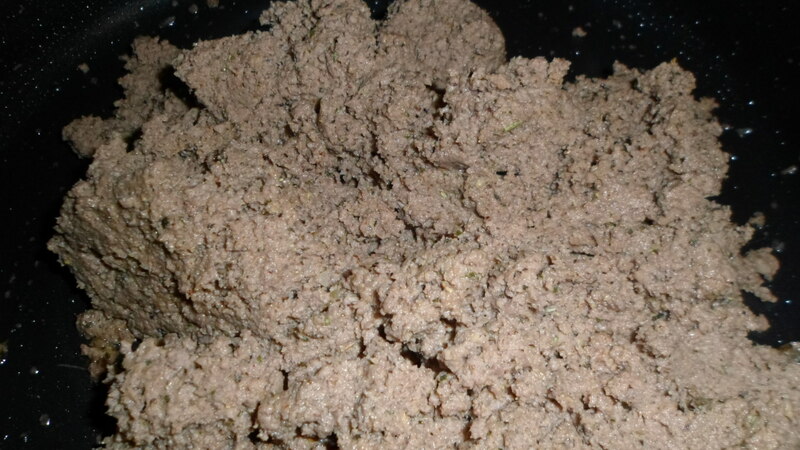 After my meat was done, I put it in the food processor to pulse and eliminate any big chunks of meat. Preheat the oven to 375 degrees F. The recipe I found said to roll the dough out to 1/8-inch thick and cut the dough into 6-inch circles, but it was so fragile, we ended up pressing the dough on a well floured surface into circles. 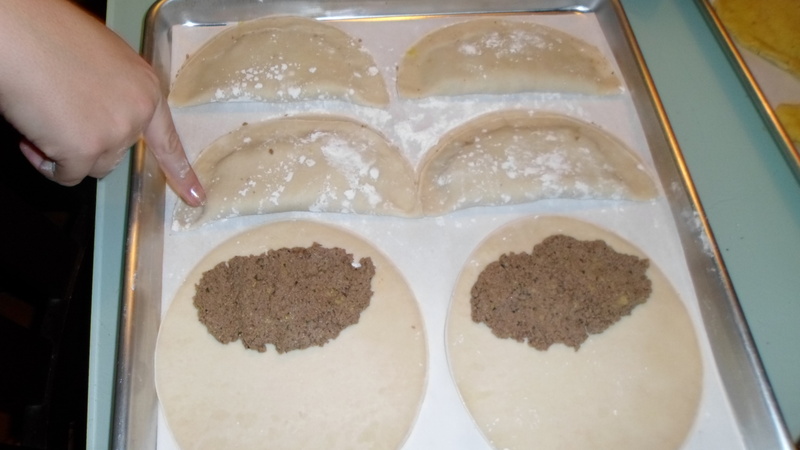 Place 2 tablespoons of the meat filling onto half of each dough round. Brush the edges of the dough with the egg wash. 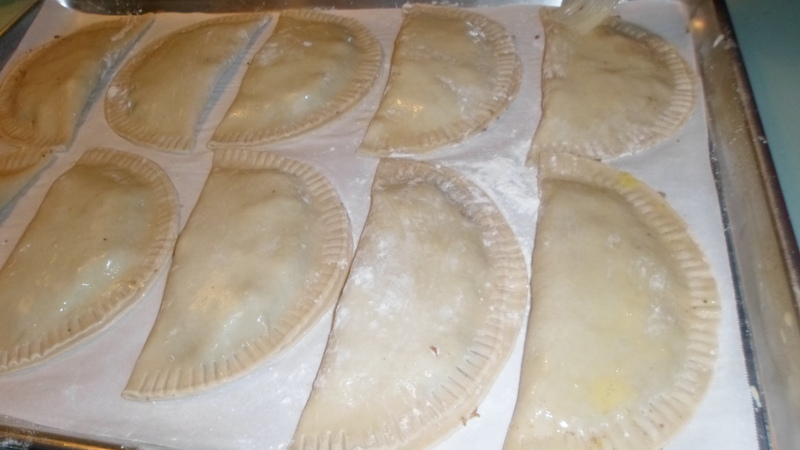 Fold the dough over the filling to make a half moon shape and press with fork to seal. 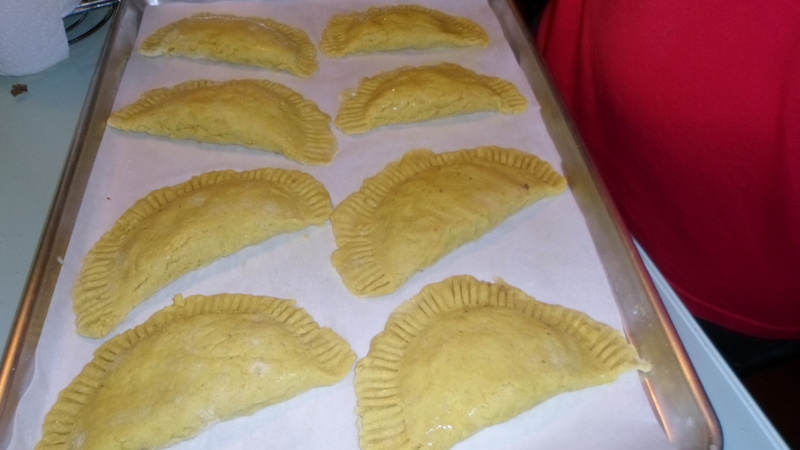 Place the patties on a parchment lined cookie sheet and place in the oven for 25 to 35 minutes. 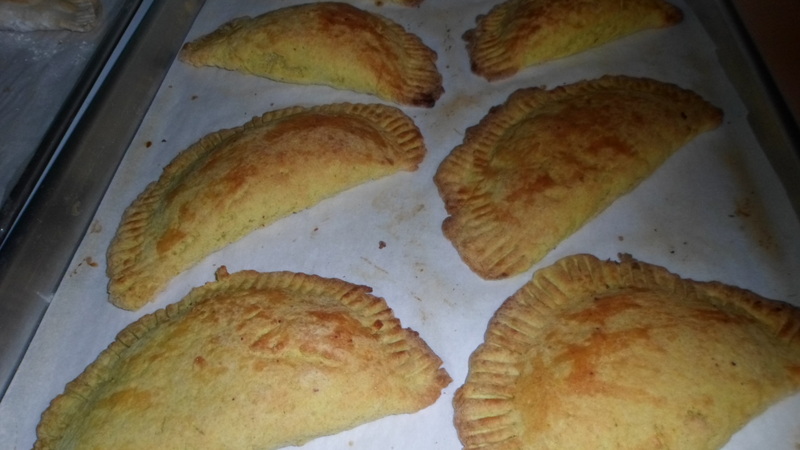 I doubled the filling recipe and made some for the kids who are not eating gluten free and used frozen pastry/empinada dough from Goya. I won’t lie, it was a bit of work. Good weekend type of thing to make. Both versions came out looking nice. 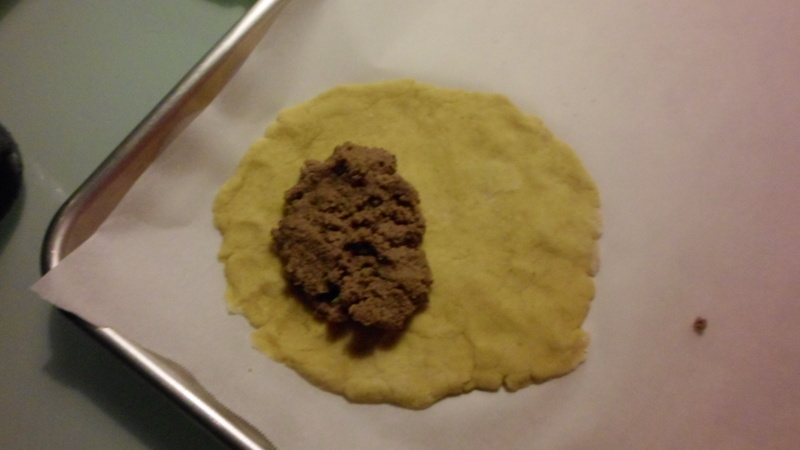 The gluten free dough was flaky and a bit sweet, so it cut the spiciness of the filling. The Goya pastry was a bit bland and didn’t cut the spiciness at all, so those were more spicy.